TORIK Stone Cleaning System meets the most discerning specification requirements while being portable and efficient. TORIK’s controllable stream of high pressure superheated water and steam quickly removes grime, moss, algae, fungi and many other types of soiling. Combine with TAVEC 201 for a complete paint removal solution. TORIK Stone Cleaning System provides the option of chemical-free cleaning and optimal results with Tensid products. TORIK produces a controllable stream of high pressure superheated water and steam that quickly removes grime, moss, algae, fungi and other biological matter. The superheated water and steam also kills spores thereby eliminating the source of biological growth. Cleaning and paint removal with the TORIK system is gentle, safe and effective for use on stonework and brick masonry. TORIK stone cleaning system is a two-component piece of equipment that is mobile enough to be transported in a van, yet robust enough for even the toughest stone cleaning projects. TORIK generates superheated water in a diesel burner and an electric pump generates the controllable high pressure delivered through a high pressure lance. The operator has full control of pressure and temperature for optimal cleaning and surface protection. The 15º to 25º cleaning edge is created with a ceramic nozzle for optimal precision. 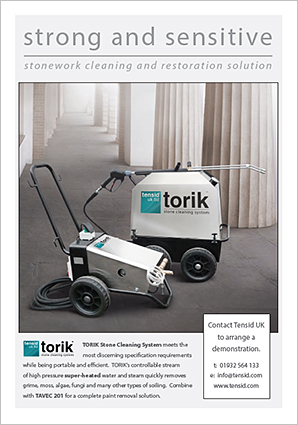 TORIK Stone Cleaning System is available to buy or hire. Call 01932 564 133 or email info@tensid.com to learn more and arrange a demonstration.